From the makers of the Primetime Emmy®-Award winning “The Men Who Built America” and narrated by two-time Oscar® nominee Jeremy Renner (Actor in a Leading Role, The Hurt Locker, 2009, Actor in a Supporting Role, The Town, 2010), HISTORY®‘s The World Wars, arrives on Blu-ray (plus Digital HD) and DVD (plus Digital) on September 9 from Lionsgate Home Entertainment. Originally premiering Memorial Day on HISTORY, 13 million viewers tuned in to all or part of the three night event series The World Wars, which averaged 4.3 million total viewers and 1.7 million in both adults 18-49 and adults 25-54 in Live + 7 viewership. Commemorating the 100th anniversary of WWI and 75th anniversary of WWII, the epic series traverses three decades of war through the eyes of the men who were on the front lines including insightful interviews with historians and modern-day politicians as well as dramatic reenactments. Adolf Hitler. Franklin Delano Roosevelt. Benito Mussolini. Winston Churchill. Charles de Gaulle. George Patton. Before they were the giants of WWII, they were infantrymen and privates in WWI, the “war to end all wars.” The World Wars from HISTORY® and H2™ brings you the story of the devastating three decades of 20th-century world war through the eyes of the men whose characters were forged in the trenches before they commanded a world on the brink of disaster. See how, from Ypres and the Somme to the Battle of the Bulge and the invasion of Normandy, the iconic figures of WWII became synonymous with either battlefield glory or murderous fascism. The 2-disc Blu-ray and 2-disc DVD contain bonus materials that include in-depth looks at the men who shaped history, numerous featurettes that delve further into the history and legacy of the wars plus deleted scenes. 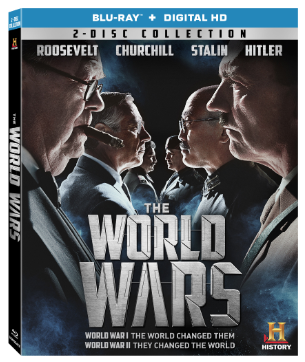 The World Wars will be available for the first time on Blu-ray Disc and DVD for the suggested retail price of $29.99 and $26.98, respectively. Title Copyright:The World Wars © 2014, Cover Art and Design © 2013 A&E Television Networks, LLC. All Rights Reserved. Swamp People, HISTORY, the “H” logo and A+E Networks are trademarks of A&E Television Networks, LLC. Distributed by LIONSGATE® under license from A+E Networks Consumer Products™.